When the weather starts to get cold, all I want to eat is slow cooked and hearty meals. 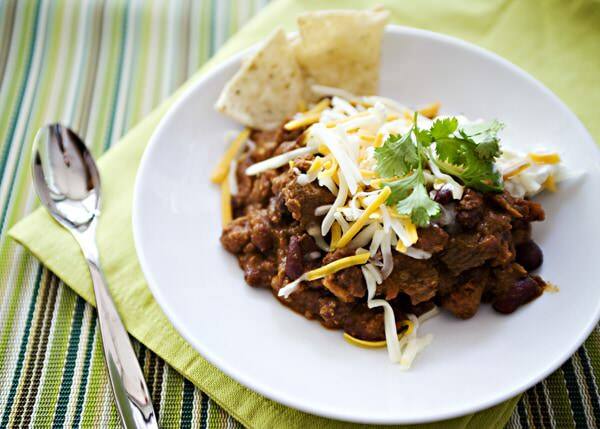 This chili recipe is one of my favorites. 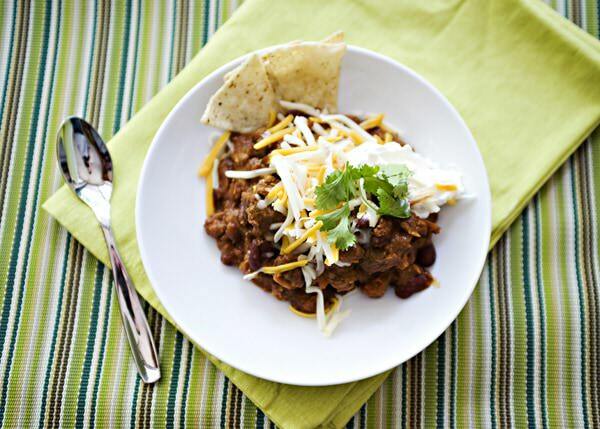 I watched Nigella Lawson make it on the Today show years ago and it has been my go-to chili recipe ever since. While the title may alarm you, you cannot tell that their is chocolate in the chili. It just adds a little something that you cannot put your finger on. I love this recipe because I can put it together in minutes and then it goes in the oven (or you could transfer it to a slow cooker) for a few hours. When the times rolls around to get the chili on the table, the kitchen has been cleaned up, the table is set, I’ve folded a few loads of laundry, and I have sat on the couch for a bit flipping through Us Weekly. We do not need to share that last bit though, we want people to think that we slaved. This recipe makes a ton. I mean a lot. So either half it like I did here (I am including the full recipe below) or freeze half for another time. It also is one of those dishes that tastes even better the next day. If you are making it for a party, definitely make it a day ahead of time and just reheat it when you are ready to serve. I was lazy this day and put the onions and garlic in the food processor. In a large Dutch oven over medium heat, cook the onion, garlic, and red chile until soft, about 10 minutes. Add the cardamom, cumin, coriander, cinnamon, and pepper flakes. 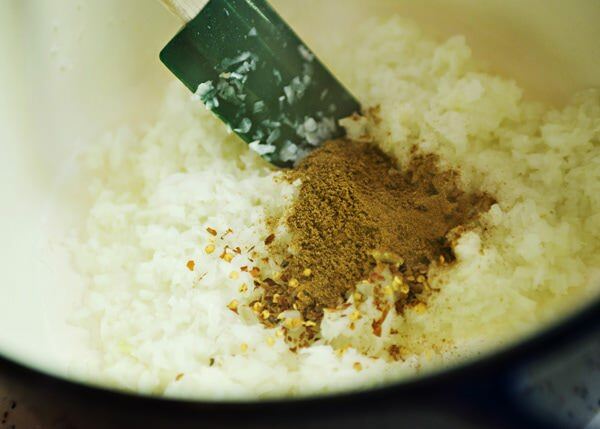 Cook the onion and spice mixture for a minute or two. Take the chorizo out of the casing and add to the pot. 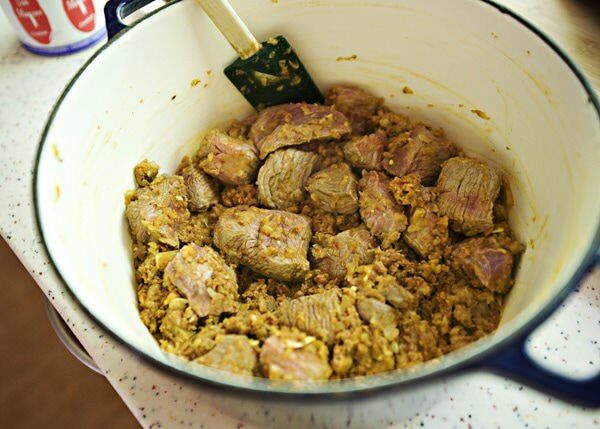 Add the beef and cook until it starts to brown. Add the beans, tomato paste, ketchup, diced tomato, and water. Bring the chili to a boil. Once the chili comes to a bubble, add the chocolate chips. Stir the chips in until they melt. Cover the pot and put in a preheated 300 degree oven. Cook the chili for 3 more hours. Give a taste and check to see if you need salt and pepper. 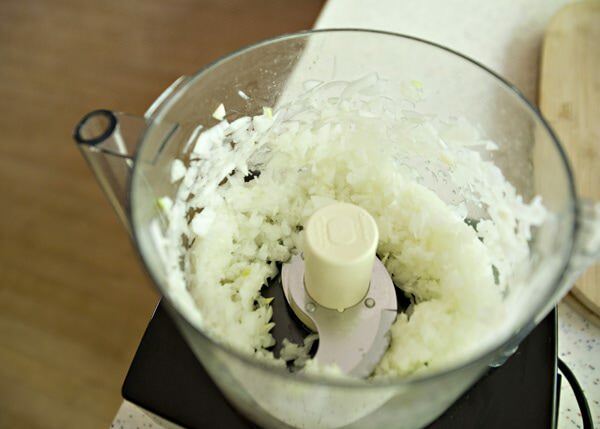 Put the onions and garlic in the food processor. Is this spicy? I’m working on the kids to get them to like chili, so I’ve had to be pretty bland lately. I’m curious about the chocolate. Usually my secret ingredient is adding a can of enchilada sauce. I’m going to have to try this one. Not really. If you are worried about spice, leave out the red chile. I do sometimes when my children will be eating it as well. honey would be great in chili. I never would have thought to add that. I am really loving your blog. So glad I found it. My son isn’t eating meat any longer. 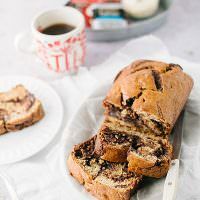 Can you suggest to me how to modify this recipe? I have used soy chorizo in things before and it was fine but you don’t get as much fat from it so the consistency isn’t always perfect. I answered this in the above comments, but you are right to add bit more oil. 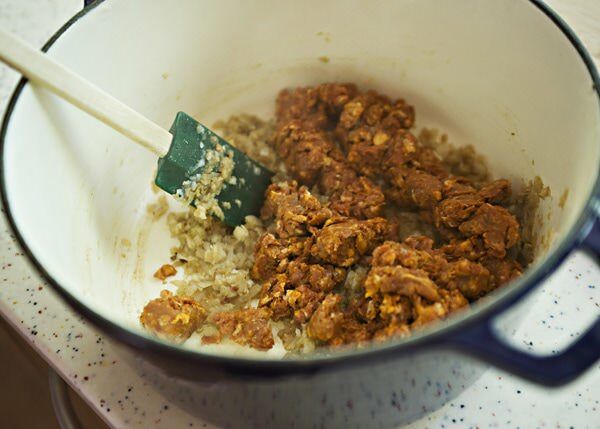 Chorizo adds fat and flavor, so you will need to add more heat and more oil. I will try it myself and see what happens. We’ve used chocolate in a meat dish once or twice before (Giada does that sometimes). This would be perfect during a cold Indiana winter! Yes it would. I know exactly which Giada recipe you are talking about, it is for short ribs. They are fabulous. How would you suggest making this vegetarian? 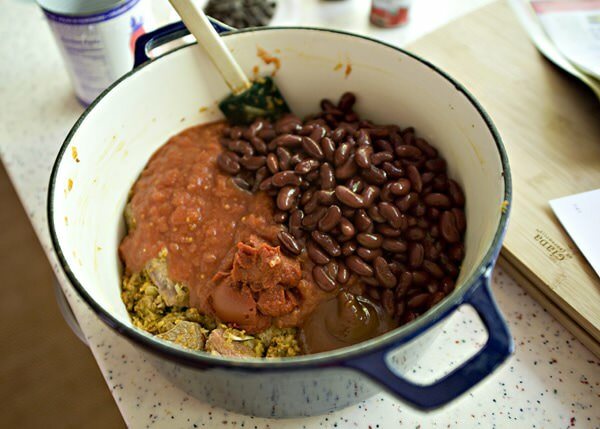 add more chiles for heat and add a few different kinds of beans. You will also probably need to add a bit more oil for cooking also. 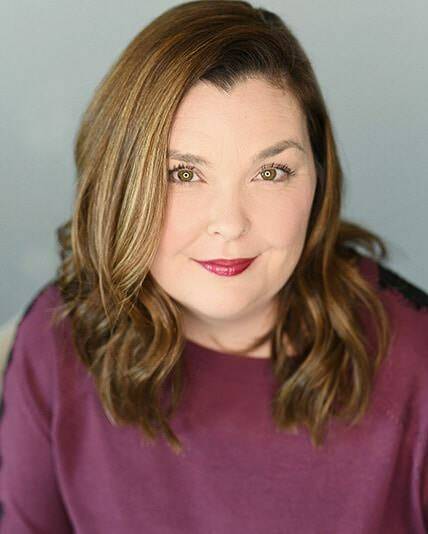 Bree, I love your website and totally admire you style and photography. Simple, yet crisp and clear through every post. A perfect blog in every sense. Fabulous job with your step-by-step detailing too. They are inspiring. Thank you so much, that is such a nice thing to read. This sounds delicious; Love slow cooked meals. me too, I love to eat them and to make them. Sounds interesting! I love chili, I love your blog, and I love Nigella so I guess I’ll have to give it a try! This sounds so unique and I bet the chocolate gives a great depth to the flavor. I’ll definitely have to give this a try. 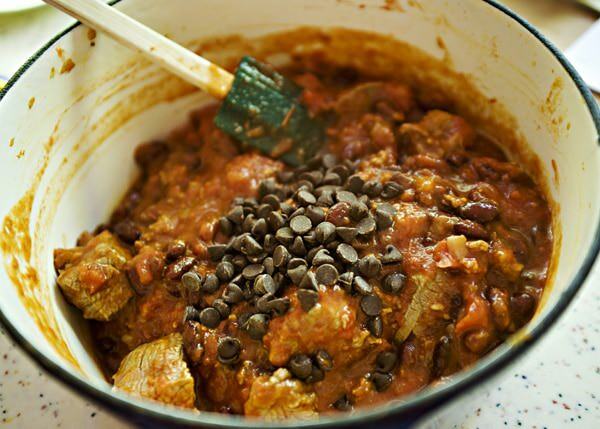 Chocolate chip chili? What an interesting ingredient! Worth a try! You cannot taste the chocolate, but it does something to it. If I don’t have an oven-safe pot, do you think I can keep this at a simmer on the stovetop for a few hours instead? Absolutely. Just give it a stir every now and again. I made this last night for a party, and it was a HUGE success. Thanks for posting it and making it so easy. I couldn’t find chorizo at my grocery store, so I bought “Chourico” a Portuguese sausage. It seemed to work well, but I’m hoping to find the real chorizo next time. Where did you get yours? I got mine at Whole Foods, but most store carry it. I have also used hot Italian sausage and it has tasted wonderful as well. Maybe I will. Thanks for the suggestion. This recipe sounds delicious and I can’t wait to try it! 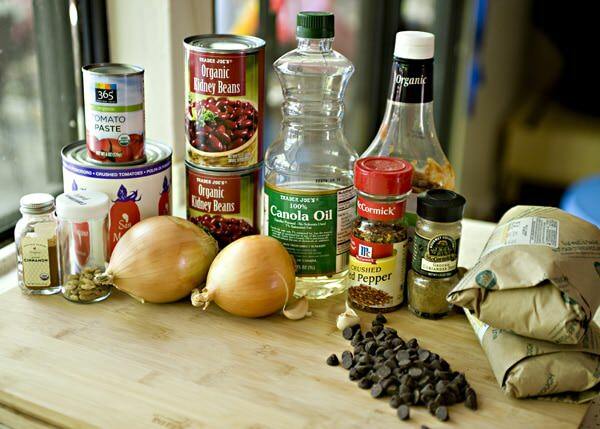 Quick question – the recipe calls for cardamom seeds and ketchup, but you do not mention using them. Are they not needed? Also, do you suggest using semi-sweet or milk chocolate chips? Thanks for noticing this, I’ll go in and fix it. The cardamon goes in with the spice mixture and the ketchup goes in with the tomatoes. I use semi-sweet or anything dark that I have around. I may have missed it but when is the best time to add the oil? Thanks Bree, love your site! Add a bit when you cook the sausage. Sorry if I left it out. Nigellas recipes are really great and Your version of the recipe looks brilliant. Hi – if I am to half the ingredients, does the cooking time stay the same? Most likely, I would check it about 30 minutes before the end of the cooking time. I am really interested in making this recipe but when reading the directions when do you add the ketchup and the cardamom seeds? You can add it in whenever you want, it doesn’t really matter. I’ll edit this recipe to add them in. Thanks for letting me know. If I’m doing full recipe for a party how many do you think it feeds?